A game worth melting for! It has been 10 months since the release of Disney Frozen, and the craze has remained strong. 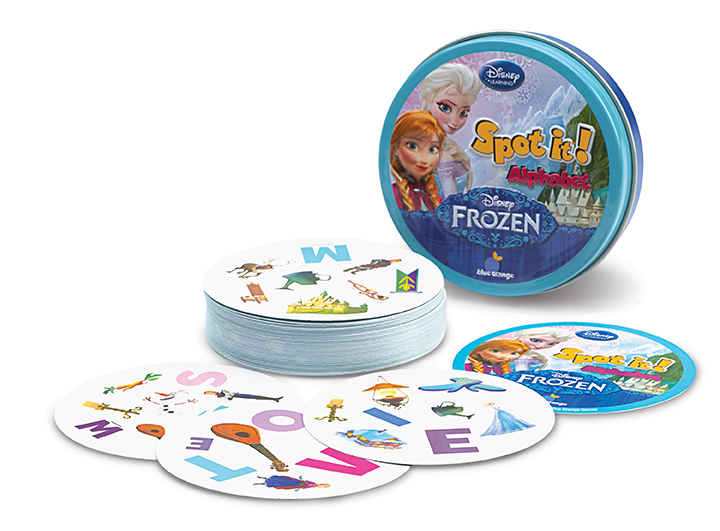 The love of Frozen has expanded to tooth brushes, costumes, plush dolls, and Spot it! 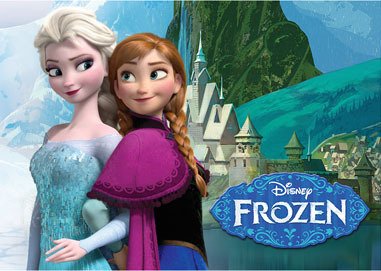 All over the world, people, young and old, have been captivated by the story of two sisters, Elsa and Anna. Their story brings a bit of unexpected darkness to the expected Disney Fairy tale. A relateable theme of two sisters who become estrange and their struggles to find their way back to each other. Elsa had been repressed by her parents and kept from her sister, but eventually emerges into her own after realizing her powers of freezing the objects around her. 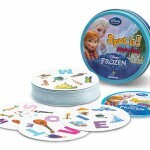 The Disney Frozen craze has brought limitations and new ideas to the world of Disney. The demand of retail objects became so high that Disney ran out of merchandise online and inside of their stores. At one point, Disney had to restrict all consumers to two items of purchase for many weeks; that was if there were even 2 Frozen items left to buy. A recent release by Disney states that ‘Frozen-world” will be the latest feature added to Epcot. The attraction will be opening in 2016 as the construction to the current Norway Pavilion will take place this fall. “Frozen-world” will be a hit with a boat ride, snow play areas, and of course an area to meet and greet Elsa and Anna. As if this is not enough, a short film will be released by Disney in the next year, called ‘Frozen Fever’. 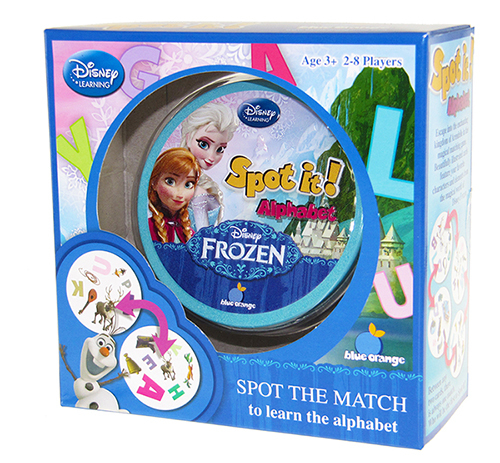 Blue Orange Games has caught the Frozen fever and teamed up with Disney to bring you a new adventure. Spot it! Alphabet Disney Frozen is a matching game that features characters and iconic symbols from the hit movie. Between any two cards there is always one, and only one, match. What could be better than the #1 family card game teaming up with the winner of two Academy Awards®?! This is definitely a game worth melting for. The process of creating a Spot it! Alphabet Disney Frozen was a blast for the Blue Orange team. First, the marketing team gathered around and watched Disney’s Frozen together—and yes, Olaf made us laugh. Watching the movie helps to prepare the team to search through the Disney Database to find just the right images from Frozen. 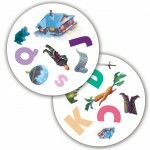 Once those symbols are selected, they are then tested by the toughest critics—children. This is to mostly check to see if the chosen images evoke memories from any part of the movie. Whether you are caught singing ‘Let It Go” in your car or laughing with Olaf, chances are Frozen has warmed your heart. Young and old can relate to this theme of connecting with a loved one, coming into their own, or simply wanting to be loved. Throw in a funny snowman, great songs, and some sparkly dresses and you have a Frozen craze. Spot it! 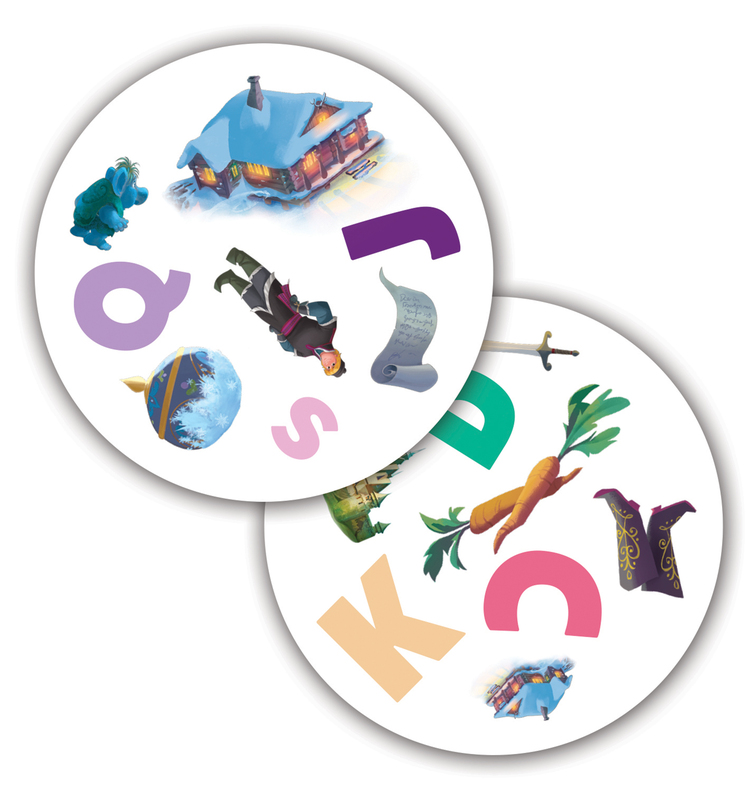 Alphabet Disney Frozen is a great way to incorporate fun and learning with Elsa and Anna. It is a wonderful birthday gift and stocking stuffer too! Our Very Own Holiday Gift Guide! Introducing our New 2018 Games! 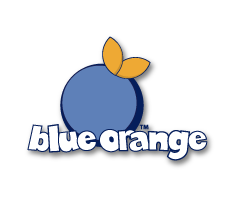 © 2019 Blue Orange Games Blog. All Rights Reserved.